USArtists International supports performances by U.S. dance, music, and theater ensembles and solo artists invited to perform at important cultural festivals and performing arts marketplaces anywhere in the world outside the United States and its territories. USArtists International grantees reflect the vibrant diversity of U.S. artists and creative expression in the performing arts. The next deadline is April 3, 2019 at 11:59 PM ET for engagements between July 1, 2019 and June 30, 2020. To learn more about the program, see additional deadlines or access the online application, please visit our website. USAI is funded by the National Endowment for the Arts, the Andrew W. Mellon Foundation, the Howard Gilman Foundation, the John D. and Catherine T. MacArthur Foundation, and the Trust for Mutual Understanding and is the only program of its size and scope in the country. Prince F.M. Lamba is a Folklore and Public Culture graduate student at the University of Oregon. 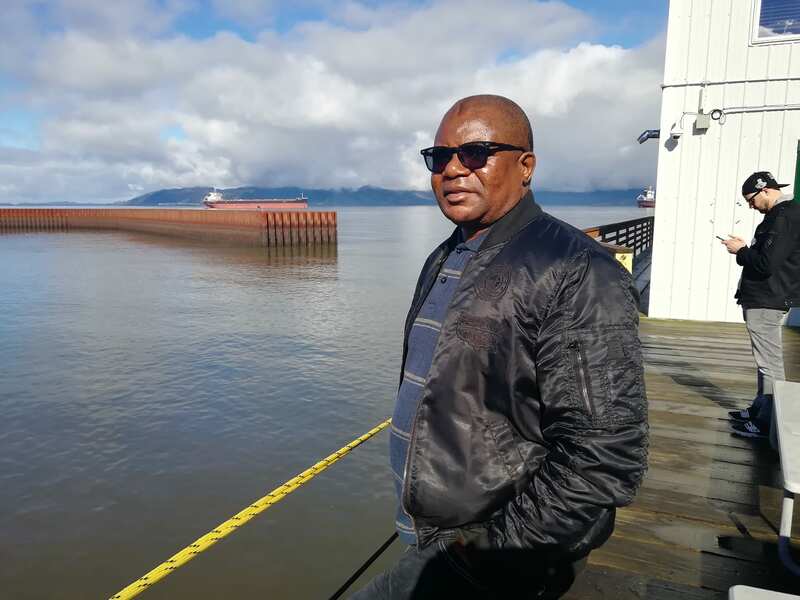 He is an ethnomusicologist with scholarly interests in urban ethnography, African musical arts, creative industries, arts and culture management and issues related to arts and culture in development. He holds a master’s degree in arts and culture management from the University of the Witwatersrand in South Africa. Prince has worked for both public and private institutions including the Zambian Department of Arts and Culture, American Embassy in Zambia, University of Zambia and the Zambian Open University. He is also the founder and artistic director of the Pamodzi Dance Troupe in Zambia. While in Benton and Linn Counties I encountered numerous wonderful and generous people connected to many vibrant traditions, including fly-fishing, boat building, instrument building, quilting, fiddle music, and various foodways. I was particularly struck by the area’s social dance traditions. 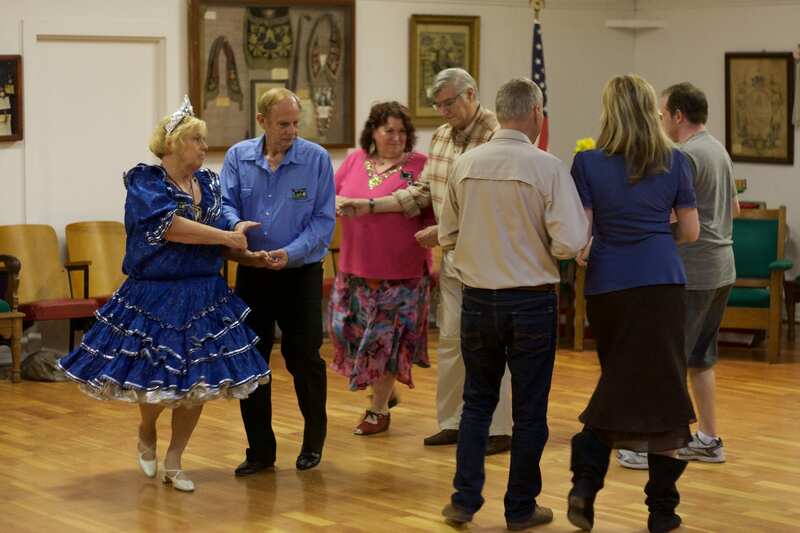 During the three weeks I spent traversing the two counties, I attended three different social dances, although I could have attended one nearly every single night. 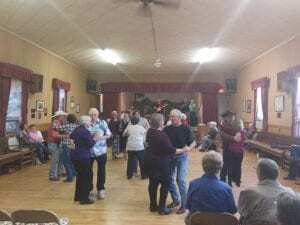 The Jefferson Jammers perform on Wednesday nights at the Morning Star Grange Hall in Millersburg. This dance started as a country music jam among retired musicians who still wanted to play. Bruce and Joann Hamilton held the first few jams in their home, but it quickly outgrew their capacity, and they moved to the Grange Hall. 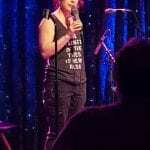 Today it serves as a place for musicians to gather to play country music together; anyone interested can also sing along in a kind of live-backed karaoke. 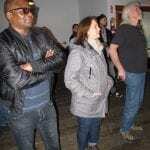 The audience is busy dancing with the floor usually occupied by at least 30-40 dancers. Mostly attended by local residents above the age of 50, the dance also brings in younger participants. Most attendees told me it’s the highlight of their week. 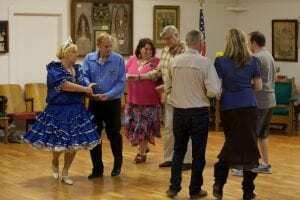 The Albany Timber Twirlers Modern Western Square Dance club’s membership is diminishing in number but not in dedication. In nearby Albany, the Albany Timber Twirlers are a Modern Western Swing Dance Club (one of four clubs in the area) that focus on the highly precise and intricate moves of choreographed square dances. These patterns are so complicated that dancers need to take four months of lessons before they’re up to speed to participate. Club President, Bev Swearengen, told me they’re more about fun than formality. The Corvallis Contradance was by far the biggest dance I attended, with a regular attendance of around 100 people, twice a month. In Corvallis, a twice-monthly Contra dance has a regular attendance of over 100 people. Contra dance is somewhere in between the loose nature of traditional square dancing and the highly stylized patterns of Modern Western Square Dancing; like traditional square dancing, it’s led by a caller who gives instructions in a rhythmic and stylized fashion. But contra dancers form lines with each member of a couple opposite each other instead of side by side like square dancers. 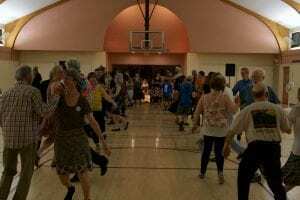 The Corvallis Contra dance also includes a live band and brings in a huge number of dancers under 40. Dance Chair, Jennifer Carlin, notes that it’s the music that makes this dance so special. 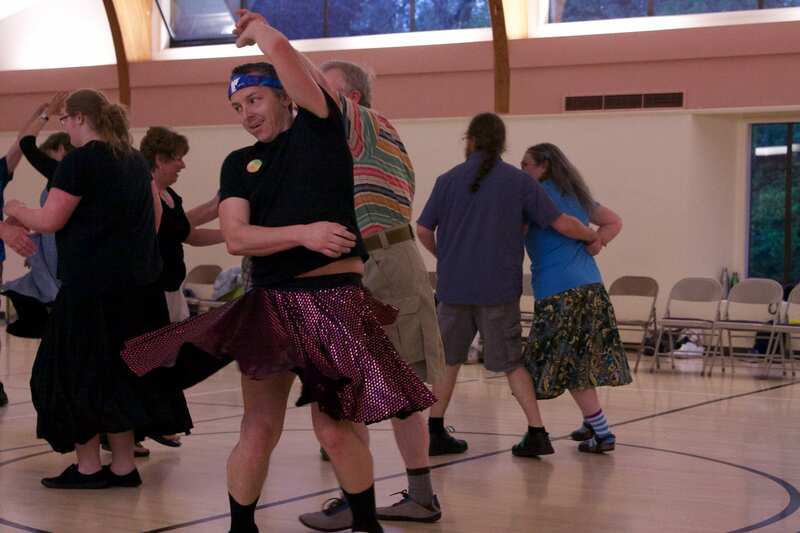 The Corvallis Contradance goes out of its way to make sure the dance is inclusive for all. But greater numbers do not always equal a more successful event or a more important folk tradition. Social dance is alive and well in this area. And next time someone in the central Willamette Valley suggests the Internet, television, or whatever latest scapegoat is killing social life, drive them to Benton and Linn County and find a dance! During the spring and summer of 2018, OFN hired me to conduct folklife fieldwork in Marion and Polk counties and at the Confederated Tribes of the Grand Ronde. The geographical area I covered was large and diverse. The sheer length of each county encompasses a landscape in transition—mountain to valley to coast. Each day brought new surprises: green fields and grasses in wine and sheep country; bustling city streets; pine-encompassed mountain lakes, and winding, sparkling rivers. The landscape reflects the local agricultural and industrial economies. The people are equally diverse, each a wonder in their own way. Their identities and folk arts and practices also reflect the topography and economy. Whether loggers creating art from the medium they know inside and out (wood), transplants from foreign countries carrying on traditional skills, Native artists connecting to roots that were once taken away, or farmers keeping their multi-generational farms relevant and operational, the people of the Willamette Valley adapt to their surroundings. They preserve the identity that is most important to them while being rooted in traditions they cherish. I felt honored to document a snapshot of Oregon’s ever-changing, rich cultural landscape. Chainsaw carver James Lukinich (Willamina) lived in Oregon until age 14, when he traveled to Alaska to join his brother and learn the logging business. For James, wood carving was a natural art form to pursue during long stretches of isolation in the Alaskan wilderness. 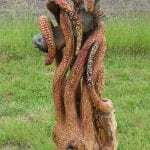 While he worked as an arborist in San Diego, chainsaw carving went from hobby to career as he completed an increasing amount of custom jobs to repurpose tree stumps. 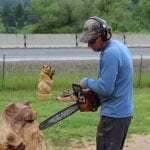 He began participating in chainsaw carving competitions in 2009 and finished in the top 10 at the national competition in Reedsport last year. 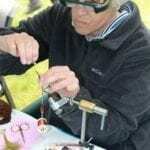 He and his wife, Marilyn, returned to his Oregon home, where he has continued to practice his craft professionally. Jeremy Mitchell (Salem) is an advocate for bees. As one of the few young beekeepers with a mid-sized operation in the area, he and his bees fill an important role in the Willamette Valley, pollinating berries and other produce at small farms. Schooled in beekeeping by his great-uncle, Wayne Porter, and through the OSU Extension Master Beekeeper course, Jeremy took over Flying Bee Ranch from his relatives in 2017 after Wayne’s passing. 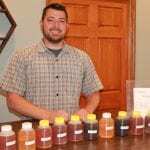 At that time, Jeremy transformed from hobbyist to full-time, professional beekeeper, helping his great-aunt, Kathy Porter, keep the business a family operation. They are known for their mono-source honeys, captured after the bees pollinate specific crops. Jeremy also works to educate the public about bees’ role in agriculture and strategies for keeping them safe. 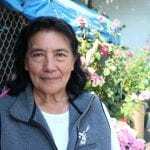 Connie Graves (Sheridan) is a traditional basket weaver of the Confederated Tribes of the Grand Ronde. 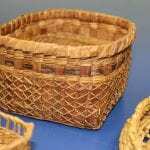 She’s been instrumental in revitalizing and teaching the art of basket weaving for her Tribe. 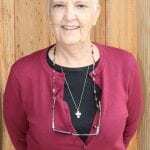 Born in McMinnville, she has lived her entire life in the Grand Ronde area. Connie has always possessed a love of craft and creativity and an ability to create by simply looking at an example. With her masterful basketry skills, she makes hats, baskets of all dimensions, doll clothes, baby rattles, or whatever she is inspired to do. She collects and works with many varieties of reeds, grasses, barks, and roots. Connie is currently battling cancer but still exudes positive energy and strength in all she does. Her help in the project was enormous. As an addendum to my fieldwork in Polk and Marion Counties and with the Confederated Tribes of the Grand Ronde, I was privileged to conduct some further documentation in Lane County. 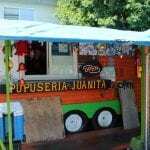 Juana Cortez (Eugene) owns and operates Juanita’s Pupusería, a food truck specializing in food from El Salvador. 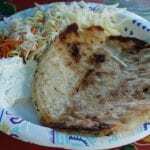 A pupusa, the national dish of El Salvador, is a thick flatbread made of masa—corn flour and water—stuffed with one or more ingredients such as cheese, squash, refried beans, or meat, then cooked on a griddle. The versatile flatbread comes from the Maya/Pipil culture of El Salvador. Cortez, a restauranteur in her native country, came to the US in 1987 as a refugee of war and natural disaster. A single mother, she worked and saved for years before returning to her dream of owning and running a restaurant. What began as a pupusería has expanded into a celebration of Salvadoran and Mexican foods. If someone asks for it, she can make it, she says. Cortez’s food traditions connect her to homeland and, more importantly, allow her to enjoy peace and stability after a life of hardship and perseverance. These individuals represent a few of the many hard-working, diligent bearers of folk traditions I documented for this project. Like Oregon’s beautiful landscapes, these people deserve to be celebrated and supported as part of the cultural landscape. In the Winter and Spring of 2018, I attended many of Lane County’s regional cultural events, festivals, and fairs to scout out tradition keepers for the Willamette Valley Folklife Survey. The Willamette Valley is homeland to the Kalapuya Tribes, with the Molalla calling the foothills of the Cascades home. 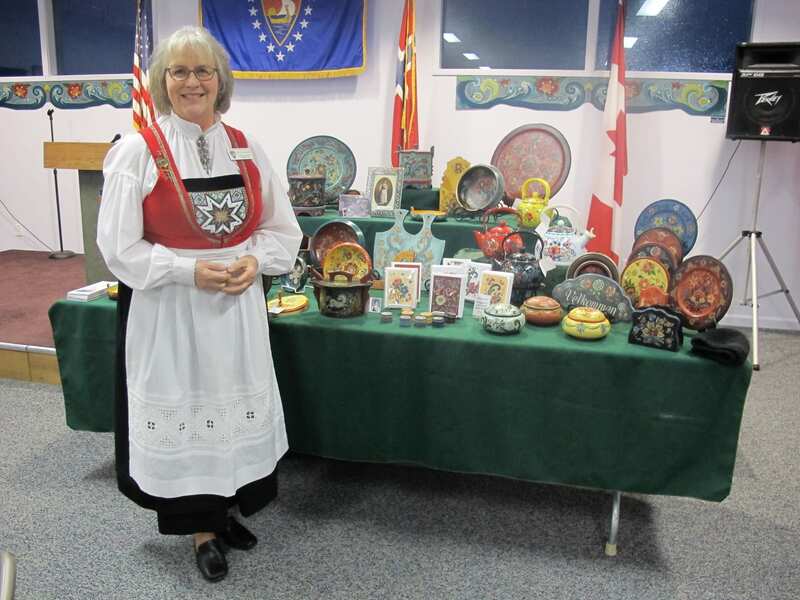 More recently, a significant Scandinavian population settled Junction City, where the annual Scandinavian Festival attracts attendees from far and wide to try a taste of Danish aebelskiver (apple pastry), participate in Swedish folk dancing, or watch a Norwegian artist demonstrate Hardanger embroidery (usually white on white embroidery with cutwork to create a lacy effect). Eugene’s Sons of Norway Sonja Lodge (Lane County) participate in the festival, and I had the pleasure of getting to know many of their members at their annual Lutefisk dinner in January. Before the dinner, I watched lodge members peel potatoes for the lefse (potato flatbread) and bake traditional Norwegian desserts and cookies. And I got to have my first taste ever of lutefisk (cod preserved in lye, rinsed and boiled, then served hot with butter). As someone of Norwegian descent myself, this notorious cultural delicacy was on my bucket list, and I was not disappointed. 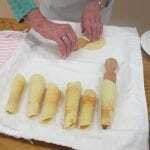 Lodge members did assure me, however, that their lutefisk used to be much stronger! 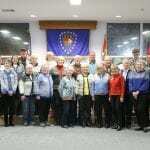 I also attended a lodge-sponsored Norwegian Sweater Night for which members donned their Norwegian-style knitted sweaters and shared stories about the talented needlewomen who made them. I discovered that Norwegian knitters make their purl stitches without moving the yarn to the front of the needle. There was a palpable celebration of their heritage in such stories, and a sense of humor and pride in the discussion that detailed how this unique style differs from standard knitting. In February, I celebrated the Asian Lunar New Year of the Dog in Eugene at the “Bark to the New Year” festival. There I met Kathy Hoy, a traditional Chinese ink brush painter. 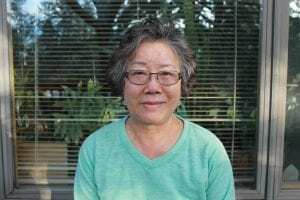 Before moving to Eugene to attend college, Kathy learned to paint by apprenticing with Huang Jun Pin, a famous traditional Chinese brush painter in Taipei, Taiwan. 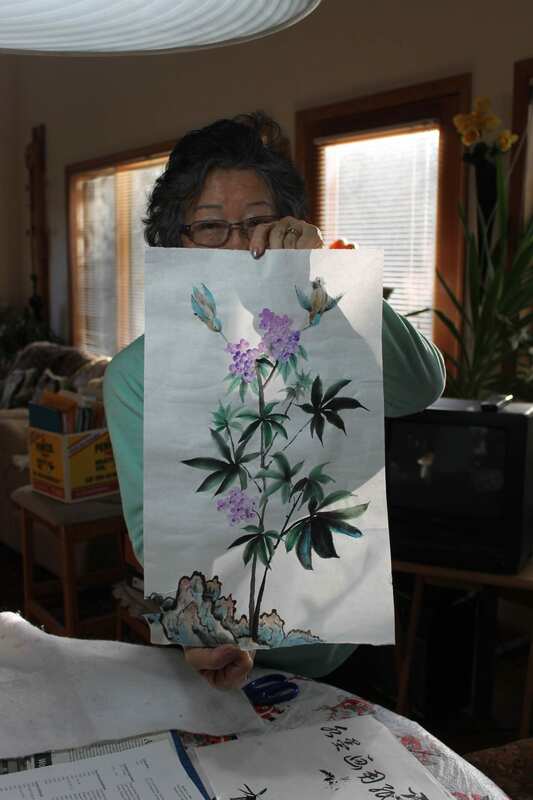 She creates traditional Chinese ink wash and watercolor on rice paper. Many of her paintings have traditional symbols of nature such as water, fish, birds, and mountain landscapes as well as Chinese characters. 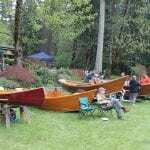 In April, I headed out to Vida, Oregon, for the McKenzie Drift Boat Festival, where I met river guides and a conch mushroom artist, learned about wooden drift boats, and watched fly fishers demonstrate how to make fly ties. Along the way, I marveled at the chainsaw art along the McKenzie Highway, which celebrates these roadside sculptures each year in July at the McKenzie River Chainsaw & Arts Festival in Blue River. 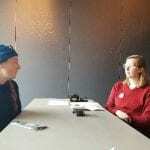 Lane County also hosted the Evergreen Tattoo Invitational in March, which prompted me to speak with local tattoo artist, Suzen Tattoozen, co-owner of Whiteaker Tattoo Collective in Eugene’s Whiteaker neighborhood. She is known for her unique custom designs, and ornate, embellished, illustrative watercolor styles. Tattoozen has high standards and is very passionate about representing the industry with the highest of integrity. She says no to tattoos she believes will not be good art, and she asks a lot of questions before agreeing to do a tattoo. But she also believes in never judging a client’s ideas. She thinks of tattoos and body art as the “freedom of owning yourself.” She is slow to start when she begins her work because she wants to get to know her client’s skin. 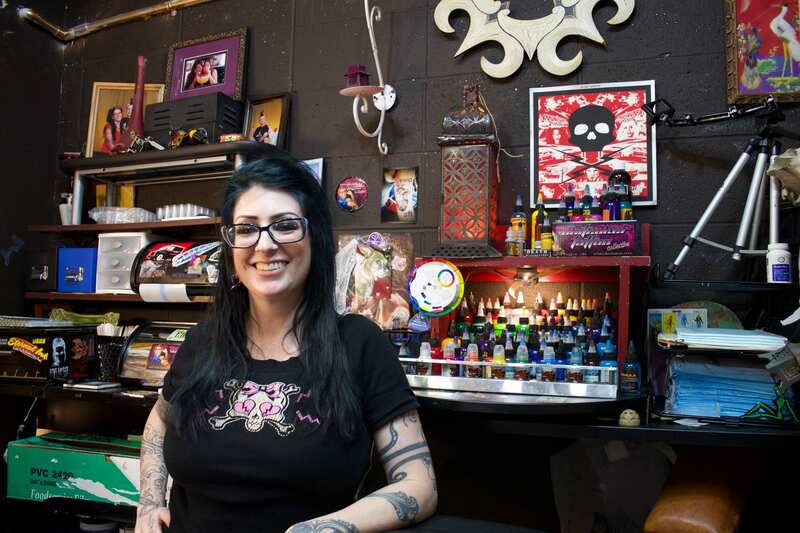 Tattoozen also runs Transformation Ink, a tattoo-based charity; she believes that tattoos are empowering and transformative and that receiving a good tattoo is treating one’s self to self-care and self-love. Tattoos, rosemåling, and fly fishing may seem very different from each other, but these culture keepers all share a love for detail in artistry, symmetry, design; an attention to story and heritage; and a commitment to passing on their skills and knowledge to others. Folk and traditional artists like these continue to enrich Lane County’s diverse cultural and regional heritage. 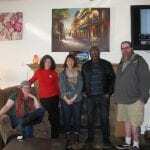 OFN staff also took part in the 22nd annual FisherPoets Gathering in Astoria, Oregon on Feb 22-24. Riki Saltzman and 5 of her Public Folklore students volunteered at FPG and interviewed 5 fisherpoets/commercial fishermen. This brings the number of interviews in OFN’s FPG collection up to 40 (2012-2019). Thanks to UO’s Folklore and Public Culture Program for funding the students’ and OFN’s fieldwork. And special thanks to fisherpoets Elma Burnham, Clem Stark, Buck Meloy, Phil Lansing, and Maggie Bursch as well as UO students Matthew Schroder, Elizabeth Kallenbach, Sarah Geddry, Prince Lambda, and Iris Teeuwen. The Oregon Folklife Network (OFN) is now accepting applications for the Traditional Arts Apprenticeship Program (TAAP) for 2019-20. This cornerstone program offers traditional/folk master artists and culture keepers a $4,000 stipend to teach their art form to apprentices from their own communities—cultural, religious, or occupational groups, or tribes. The stipend supports master artists to pass on their knowledge, skills, and expertise to an apprentice of great promise, who is empowered through these lessons to continue carrying on and strengthening Oregon’s diverse cultural traditions. We are thrilled to announce the 2018-19 TAAP awardees: traditional Irish singer, Brian Hart of Portland; hip-hop emcee, Michael “Mic” Crenshaw of Portland; traditional saddle-maker, Steve McKay of Burns; West African drummer and dancer, Alseny Yansane of Eugene; Zapotec Weaver, Francisco Bautista-Lopez of Sandy; Classical Bharatha Natyam Indian dancer, Jayanthi Raman of Portland; Indian Carnatic musician, Sreevidhya Chandramouli of Portland; and Cayuse/Nez Perce applique beadworker, Marjorie Kalama of Warm Springs. Other examples of Oregon’s many traditional/folk arts include McKenzie River Drift Boat building, Southeast Asian dance, Norwegian cooking and baking, Northwest logger poetry, Native American basket weaving, Middle Eastern embroidery, Irish or old time fiddling, African-American gospel singing, rawhide braiding, Iranian storytelling, Andean instrument building, and more. OFN encourages applications from Oregonians engaged in living cultural traditions emerging from their heritage or tribes. This program does not fund historic re-enactments, DIY revival crafts, or those who practice traditions that are not part of their own cultural heritage or community. CONTACT US: Please contact us if you interested in applying or know someone that you want to recommend. Visit our website, ofn.uoregon.edu, or contact Latham Wood (ofn@uoregon.edu, 541-346-3820) for more information about your eligibility in the program. APPLICATIONS: TAAP guidelines and the TAAP application can be downloaded at the OFN website. Staff members are available to advise applicants about the application process. If you send us your draft application 2 weeks before the deadline, we can provide helpful feedback before your final submission. DEADLINE: Applications are due at the OFN office by 5 pm, APRIL 1, 2019. Send your complete application package to Oregon Folklife Network, 242 Knight Library, 6204 University of Oregon, Eugene, OR 97403-6204. This program is funded in part by grants from the National Endowment for the Arts (NEA) and the Oregon Arts Commission. 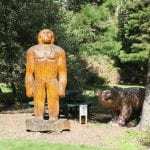 OFN is administered by the Museum of Natural and Cultural History (MNCH) and is supported in part by grants from the Oregon Arts Commission, the Oregon Historical Society, the Oregon Cultural Trust, and the NEA. The Oregon Folklife Network works to increase public investment in cultural traditions and those who practice them. Oregon Folklife Network (OFN) is administered by the Museum of Natural and Cultural History at the University of Oregon and is the state’s designated Folk and Traditional Arts Program. OFN is supported in part by grants from the Oregon Arts Commission, Oregon Historical Society, Oregon Cultural Trust, and National Endowment for the Arts. OFN works to increase public investment in cultural traditions and those who practice them. The Museum of Natural and Cultural History enhances knowledge of Earth’s environments and cultures, inspiring stewardship of our collective past, present, and future. With collections representing millions of years and all of Earth’s continents, the museum is a center for international research on topics in natural history and anthropology. Museum exhibitions are open to the public Tuesday through Sunday from 11:00 a.m. to 5:00 p.m. Admission is $5 for adults, $3 for youths and seniors, and $10 for families (two adults and up to four youths). Reduced admission is available for visitors presenting Electronic Benefit Transfer (EBT) cards. Admission is free to members and UO ID card holders. For general information call 541-346-3024. The Oregon Folklife Network is delighted to announce that we are now officially part of the Museum of Natural and Cultural History at the University of Oregon. For more than eighty years, the museum has been a center of scholarship, interpretation, and stewardship of Oregon’s cultural life, making it the ideal new home for OFN. We are delighted to become the museum’s newest division and look forward to collaborating with its faculty and staff. Our physical office remains in the Knight Library at the University of Oregon.